'Tis the day that Americans give thanks to one another and for all that is wonderful in their lives. Don't you wish people treated every day like Thanksgiving? I wish you a merry Thanksgiving! We will not be with my family for Thanksgiving, Christmas, or New Years Eve this year. This is a horrible travesty for my family. An absolute travesty! Unfortunately, it is not feasible. I am 27 years old, and this is the first first we will not all be together. Trust me. It's incredibly disappointing -- to the point of tears, even -- but then I remember how lucky I am that I have such a beautiful family to miss and be missed by. I'm so thankful! I watched the Macy's Thanksgiving Day Parade this morning. In truth, the Broadway performances have always been what I look forward to, but it's family tradition to watch it together. Even though we're all in different households now, we continue to watch it. While it's fun to watch, I think we are all hanging on to the memories that we created when it was just our family of five under one roof. 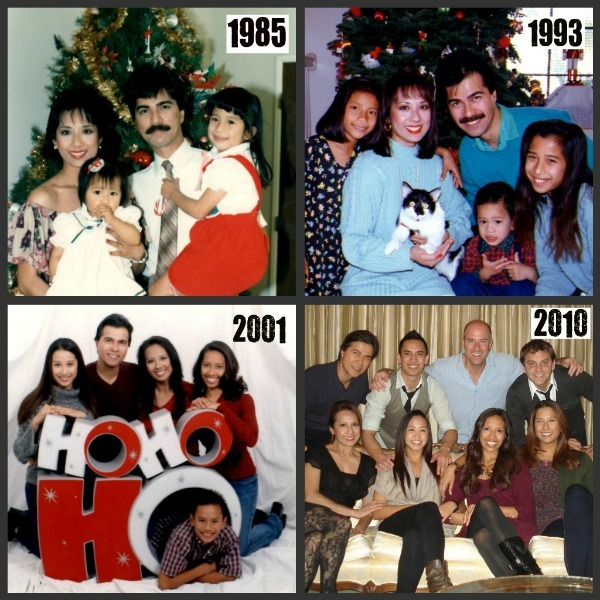 In all my nostalgia this morning, I made this collage of our Christmas photos over the years. There is so much more, but no one has the time to read that list! What are you thankful for? Ask yourself every day! I am thankful for YOU! Muah!! I'm thankful for my junk touchy. Things like space and time always try to keep us apart, but it doesn't stop us. Miss you from afar, short time but important friend.